Ford’s latest police vehicle allows cops to keep up the chase even when the pavement ends. The 2018 Ford F-150 Police Responder promises the utility of a pickup truck and the capabilities of a police car. Ford has made a police F-150 before, but claims the Police Responder is the first one to be “pursuit rated,” meaning it can handle on-road police chases. Unlike a conventional police car, it can also be used for off-road patrol work. The civilian version of the 2018 F-150 is available with an array of engines, but the Police Responder is offered with just one: Ford’s 3.5-liter twin-turbocharged EcoBoost V6. This engine produces 375 horsepower and 470 pound-feet of torque. It’s coupled to a 10-speed automatic transmission, with four-wheel drive. The Police Responder has a SuperCrew cab, meaning it has four full-size doors and plenty of room for perps in the back. The rear of the can features vinyl seats and flooring for easy cleaning. At the front, Ford installed a column shifter to free up room on the center console for police equipment. As in many modern police vehicles, the front seats have thin side bolsters to accommodate officers wearing gun belts. Mechanical modifications for police duty include an upgraded front stabilizer bar and brakes, and a more powerful alternator to handle the load of electrical accessories like police lights. The truck also has a police-calibrated speedometer, and engine-hour meters and engine-idle-hour meters to monitor usage. Skid plates and a Class IV tow hitch complete the package. Alongside the F-150 Police Responder, Ford sells police versions of the Taurus and Explorer (known as the Police Interceptor Sedan and Police Interceptor Utility, respectively), as well as the Expedition. It also recently launched a police version of the Fusion Hybrid sedan, which it claims is the first pursuit-rated hybrid police car. The F-150 Police Responder is far from a fuel-efficient hybrid. The F-150 is America’s bestselling vehicle, but it’s unclear whether it will become America’s bestselling police vehicle. 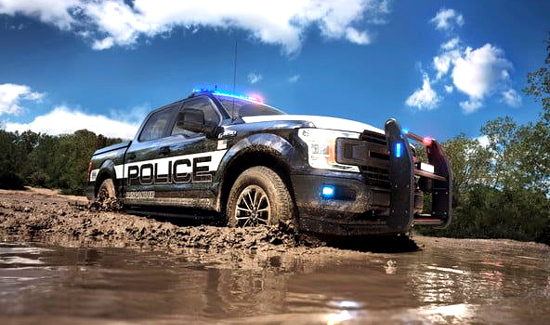 Not all police departments need an off-road-capable vehicle, and the F-150 has several drawbacks, including its immense size and poor fuel consumption. Don’t expect it to replace conventional sedans and SUVs in police fleets.